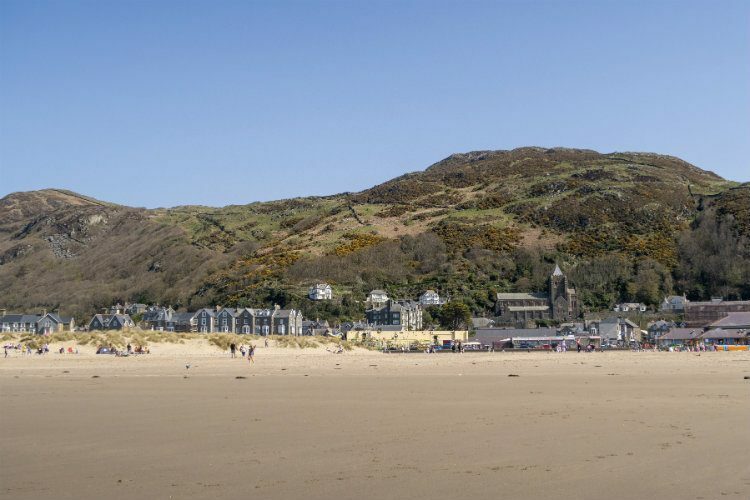 Take a look around the harbour and beach of the pretty Welsh seaside town of Barmouth. The seaside town of Barmouth sits on the North Wales coast in the county of Gwynedd. It’s a small town, with only about 2500 residents. But the population of the town is usually much higher than that, because it’s a popular UK destination for a seaside holiday. And that’s no surprise. The town has a beautiful long sandy beach and a pretty harbour with a railway bridge that stretches across it. There are masses of gorgeous stone-built houses, and the town is framed by the stunning scenery of the Snowdonia mountain range. But it’s very easy to get to Barmouth, with a train station in the middle of town. Or you could drive to Barmouth from Birmingham in around three hours. That probably explains why it’s so popular with people from the West Midlands – I certainly remember seaside breaks and days out in Barmouth when I was younger! In April, I went back to Barmouth for the first time in over 25 years. I went with Mark for a weekend to celebrate my birthday, and we took Ollie and Lyle there for their first visit. We even took Charlie the Chihuahua with us for his first family holiday! Barmouth was every bit as lovely as I remember from my teenage years, and we had a wonderful time exploring the town. We only stayed two nights, so I didn’t get to do everything I wanted to do while we were there. But that’s just a great excuse for a return visit, don’t you think? I’ll be writing more about Barmouth here on the blog in the coming weeks. But for now, enjoy this look around the beach and harbour of Barmouth. If you enjoyed this video, please give it a thumbs up on YouTube. And don’t forget to subscribe to my channel for new videos every Friday at 7pm!